Bon Scrapatit Designs: SURPRISE!!! GUESS WHO'S BACK??? I'm in between projects, needed to get my MOJO flowin' (here's hoping anyhoo) and decided a bit of scrapping would be just what I needed to ease my discomfort this evening and, hopefully, psych me up REAL good for a FULL day tomorrow!!! 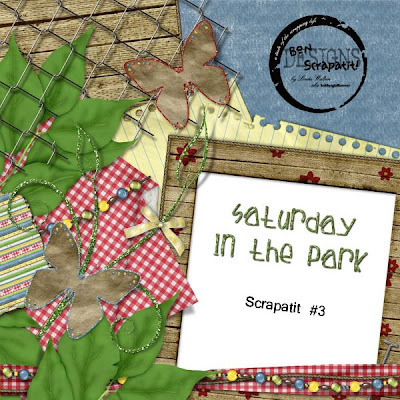 I will be working on my GOODIES for National Scrapbooking Day at 3Scrapateers and will keep y'all posted as to the CHAT and CHALLENGE I will be hosting during this weekend event that begins with a KICK-OFF chat on Friday, May 2nd!!! You won't want to miss this GALA event as there will be LOTS of FUN, LOTS of FREEBIES and CONTESTS being held throughout the entire event giving you opportunity to WIN some AWSOME prizes!!! And, of course, rumor has it that we might even see the INFAMOUS "freebie fairy" fluttering about the site and sprinkling her MAGIC dust, which means that she'll be leaving presents behind!!! I can't wait!!! The first year I ever participated in NSD, my behind stayed glued to my chair for nearly three days. Yeah, I know, not a PRETTY sight!!! I swore I'd invest in a porta-potty the following year, but caved in to getting some exercise and visiting the ladie's room when needed. I have to tell you though, Robert actually supplied my meals!!! What a SWEETHEART! I wanted to give y'all a mini-tutorial tonight but I'm going to wait and do so tomorrow night as I'm just a WEE bit tired and I need to have my faculties about me if I'm going to teach!!! LOL! Next year sometime, perhaps!!! Just kidding! For those of you that are fairly new and BRAND new to digital scrapbooking and use Photoshop Elements or Photoshop, I will explain to you how I blended the petite flowers onto the wood frame using a background paper. SUPER simple and you'll find yourself using this technique quite often I'm sure!!! I hope you enjoy the "scrapatit" I am leaving you with tonight. 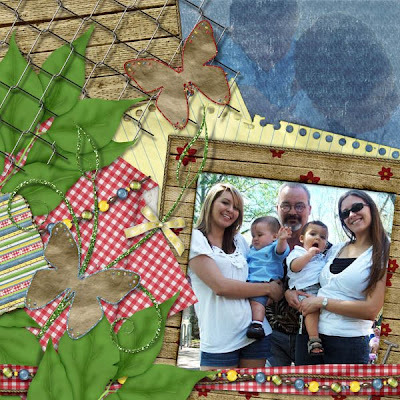 I did not finish my layout as I need to add some journaling, but I wanted you to see how my "scrapatit" came about!!! Have a TOTALLY fabulous week everyone and I'll see you soon! Thank you again for ALL of the WONDERFUL "thank-you's", love and support, it REALLY mean a GREAT deal and inspires me to keep on thinking of NEW designs to share with you!!! If I have missed posting anyone's layout in the slideshow at the top of my blog, please holler at me as I have somehow overlooked it. Thanks! P.S. The layout below is one of the reasons I started this kit!!! Our BIG family gathering at Osage Park in Danville, California on Easter Sunday! The photo is of my DARLING Robert, DIL's Sofie (left) and Marlena (right) and their PRECIOUS baby boys, Lohgan and Dillon who are one day shy of being six months apart! Marlena is married to Robert's oldest son and Sofie to Robert's number three son!!! Aren't they a BEAUTIFUL family? I just LOVE them all SO much and wished they lived right next door!!! It's pretty cool as the two girls, brothers and cousins live only three blocks from each other, however, they are two hours away from us ... sniff, sniff.